Created with a simple and versatile design in mind, the Drive Medical Plastic Shower Tub Transfer Bench with Adjustable Bracket is a helpful tool for those recovering from injury or dealing with mobility issues. 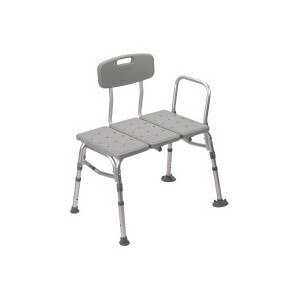 This sturdy transfer bench is made of durable, blow-molded plastic that is also featured on the backrest. With easy, reversible operation, the bench features a pinch-free lever that allows you to depress the push pins easily without pinching your fingers. A-frame construction assures sturdiness for a wide variety of applications and in a number of different environments. With tool-free assembly, this roomy transfer bench has no exposed hardware, minimizing the risk of scrapes, cuts, and other injuries. Extension legs allow you to easily adjust the height in half-inch increments so you can create a custom height that suits you or your patient's unique profile. Enjoy stable operation thanks to wide feet that help the bench stay put on most floors. An armrest to one side offers a place to grab a firm grip, and the stable frame helps ensure that anyone who uses it does so in confidence. Use this bench to move from anywhere including beds, toilets, and other surfaces so you can enjoy an improved, safer quality of life.